It is quite remarkable how an accidental archaeological discovery can catapult an obscure little town into the world map. The discovery in question is a map in fact, that is eponymous with the Jordanian town of Madaba: once a biblical fortress of the Moabite kingdom, about which there is limited historical mention in the Bible or elsewhere. It has been surmised from inscriptions and statuary that it was originally a Nabatean outpost of Petra which successively changed hands with the changing fortunes of the land. 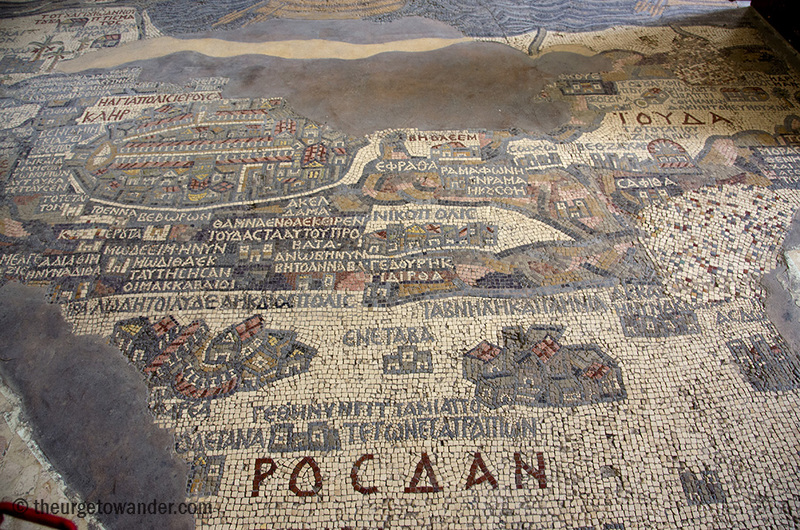 The mosaic map of Madaba. A look at the current Google map makes me wonder whether the East West orientation could be a view of the holy lands as seen from Madaba! Madaba is situated approximately a third of the way on the King’s Highway (via Regia, later renamed via Traiana Nova), an ancient thoroughfare meandering from Egypt all the way to Syria, that was once the artery of trade for the Nabateans and later the main route of pilgrimage for Christians and Muslims alike. And the control of which, determined the fortunes of every empire that held sway over the region. All that conflict and the commerce must surely have left a considerable impression on the settlements along the historic route. Madaba became part of Trajan’s Provincia Araba after Rome overthrew the Nabatean kingdom, reaching its monumental zenith in the Byzantine period. But any visible signs of that prosperity remained buried under the rubble of a 746AD earthquake, until a small (Arab) Christian community returned from their refuge in Kerak in the early 1880s to resurrect the town, and sought permission from the Greek Orthodox Patriarchate of Jerusalem to build a place of worship. Under Ottoman law, a Christian church could only be built on the ruins of an older church. And so a ‘firman‘ (Persian for decree) was sought from Constantinople in 1894, to consecrate a church dedicated to Saint James* over and “in the shape and form” of an existing Byzantine church. It wasn’t until the roof was installed and work begun on interior plaster work and paving in October 1896*, that workmen stumbled upon the hidden mosaic map beneath the debris. 6CE iconoclastic edicts (of both middle Eastern faiths incidentally) had robbed it of some forbidden figurative elements. The new construction and the delay in assessing its value, damaged it further. The oval vignette at top left is Jerusalem. Adjacent at top centre is Bethlehem. It is estimated that the original map, 51 ft x 19.5 ft (15.5 m x 6 m), comprised over 2.3 million coloured stone and glass cubes, illustrating Biblical geography from Lebanon to the Nile delta. Only one third of the mosaic survives today. Its late 6CE/ early 7CE date derived from the construction dates of the depicted monuments and the absence of those that came after. While this unique cartographic representation – oriented East to West (read top to bottom) – is not to scale, it is in effect the first complete aerial view of Palestine. The intricate three dimensional details, and over 150 Greek captions referring to place names and the twelve tribes of Israel, aiding in the identification of every single one of the 156 locations in the surviving fragment. Close up of the Jerusalem vignette: 1. The colonnaded Cardo Maximus or main street. 2.Church of the Holy Sepulchre believed to be the site of the Crucifixion and the tomb of Jesus Christ (depicted upside down). 3. Zion Gate 4. Damascus Gate. The Nea Church is the structure at the right end of the Cardo, just above and slightly to the left of the Zion gate. On the extreme right is Bethlehem. Jerusalem is depicted significantly larger and is the dominant vignette in the present space. Although it is believed that Madaba, lost forever, might very well have shared the honour in the original. The realistic portrayal of the Holy walled city: the Nea Church consecrated in 527AD and the colonnaded cardo maximus presided over by what is clearly the holiest edifice in Christendom – the Church of the Holy Sepulchre – and flanked at both ends by two monumental gates, were key elements in the dating of the map. It remains an important source of reference for middle Eastern archaeologists. 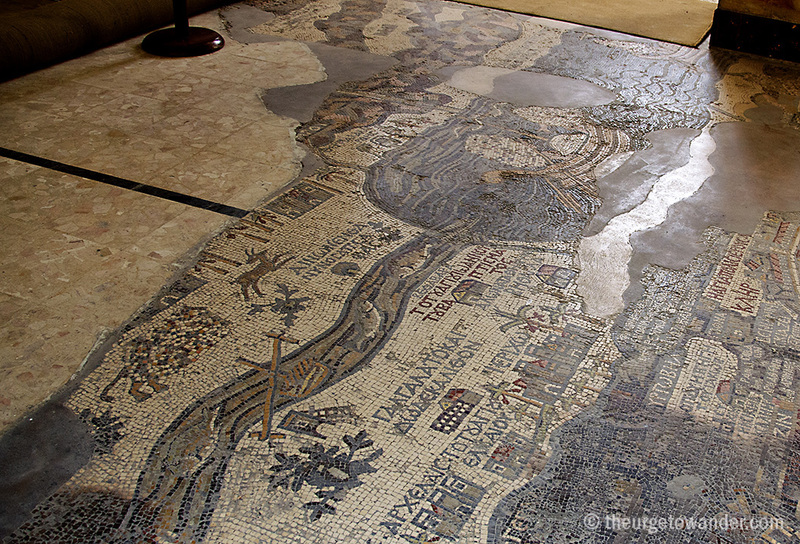 Byzantine mosaics had been unearthed in Madaba as early as 1887, and the following decades would reveal a treasure trove of hidden mosaic floors across the town. Not a single one resembled the map. The meaning and purpose of this extraordinary piece of Christian art has long puzzled scholars. Depiction of the bountiful river Jordan flowing into the Dead Sea. Note the absence of fish in the ‘Salt Sea’. A lion hunts a deer at left. Beneath the inscription: “To ton agion Ioannou ton baptismatos” just below the point of entry of the river into the dead sea is Bethabara, where Jesus was baptised by John the Baptist. The group of palm trees at centre encircle Jericho. Why a map? Why in Madaba? Could it have been a pictorial guide to passing pilgrims? Or an interpretation of the vision of Moses? Madaba’s association with Moses, the bitter conflict on his passage through these lands during the exodus, his first sighting of the Promised Land and his final moments on earth (presumed to be) at nearby Mount Nebo, all endorse the arguments for the latter, and the theory of the use of the map as a visual enhancer of the religious experience. 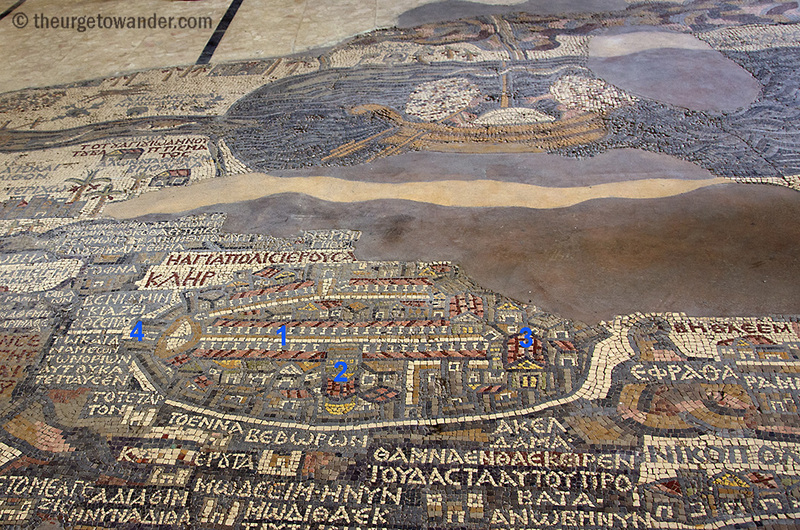 Imagine yourself back in the 6th century at a liturgy in the Byzantine church for a moment, with the symbol of Christian salvation (Jerusalem and the Church of the Holy Sepulchre) skillfully woven into the panorama of the Promised Land in that unparalleled mosaic map beneath your feet! *The church was originally dedicated to Saint James. I couldn’t find details of when and why the change to Saint George took place. *The map was unearthed in October 1986. But the official date of discovery is 13 December 1896, the day it was formally presented to a scholar for scrutiny and assessment. Amazing story, Madhu. I had no idea, thanks for presenting the history behind Madaba. Great read and once again complemented with wonderful images. What a story, Madhu….as ever, a great read and some excellent photographs 😊 have a great weekend! What an extraordinary thing, Madhu! And what a shame it was so damaged. I know. Imagine how glorious the whole map would have been! Such fascinating historical facts, Madhu. That map is a real work of art, and so huge. Congratulations on a wonderful an informative post. 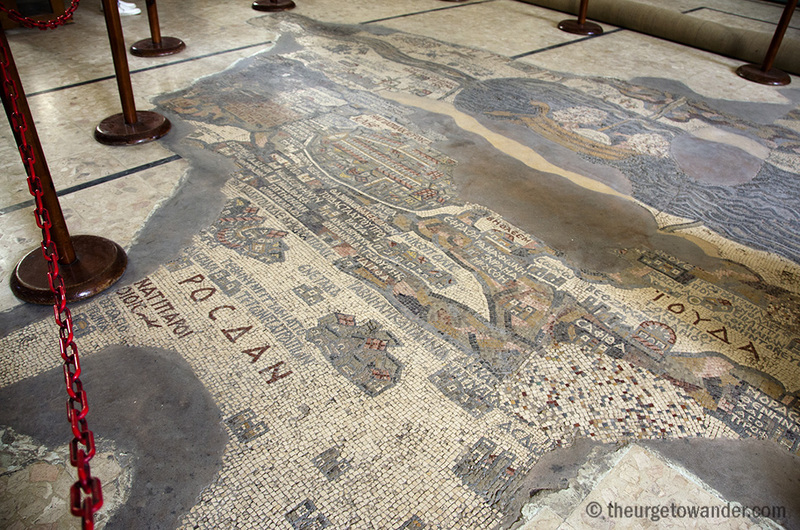 I enjoyed your wonderful report about this place and the mosaic! I love ancient history and its art I’s a treasure we have to protect! Well done! Old maps are fascinating, and being mosaic makes it more so. Great post. Madhu, what an amazing job you have done here … sometime I have hard to understand how they were able to build and create like they did through history. We have the most fantastic tools today .. but in that time, how were they able to measure everything up so it all fitted so well. This map is incredible. When were you in Jordan.??? Are you there now. Have a lovely weekend. That was so interesting. You have such a wealth of knowledge from your many travels. Always you teach us, show us a history we sometimes forget exists in a part of the world that remains a mystery to so many of us. I fear, these marvelous pieces of art will disappear under the weight of conflict. Thank you for this one, for your writing the story and giving such wonderful visuals. Great post with fantastic images – I really enjoyed it! Thank you!